Among my favorite local reclusive critters is amphiuma, or so-called Congo (conger) eel. These salamanders are the largest amphibian in North America and uniquely American being endemic to the southeastern United States. Two species occur within a 25-mile radius of New Orleans--the two-toed amphiuma, Amphiuma means, and the three-toed amphiuma, Amphiuma tridactylum. The latter is rather common south of Lake Pontchartrain and both occur north of the lake. There is only one other species of the genus, the smallest, and it occurs in Florida and south Alabama. You may have guessed its name--the one-toed amphiuma (Amphiuma pholeter). The easiest way to determine the species is to count toes. They are commonly called eels because they have long bodies and four tiny legs; the legs are so small that they are often overlooked when observed in their natural habitat. They don't walk on their legs, as do other salamanders. They basically move in a serpentine pattern and use their legs as balancing organs. Amphiumas produce a copious amount of mucus, making them hard for humans to pick them up especially as they thrash about. Being opportunistic feeders, amphiumas eat a wide variety of aquatic animals, occasionally including small vertebrates and smaller amphiumas. They are especially fond of crawfish, seeking them in open water and in the crawfishs' burrows. They are commonly encountered at night slowly cruising shorelines of ponds, swamps, ditches, and rain-filled swales. Amphiumas used to be abundant in Audubon Park and could be collected as they ventured into rain-flooded pools. They may also be seen lurking in the mouths of tunnels underwater ready to ambush passing prey. 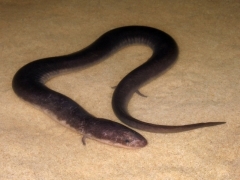 Although the average citizen has never seen an amphiuma, the salamanders can be quite abundant. In an ongoing study in Baton Rouge, John Pojman, Jr., and Dr. John Pojman, Sr., trapped 23 amphiumas in a ditch with a 230-square-foot surface area. 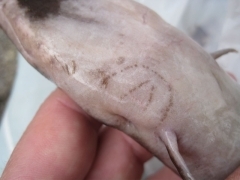 That corresponds to 0.8 pounds of amphiuma per 10 square feet! Researchers believe they are the dominant vertebrate predator in their habitats (such as ditches), if not the dominant biomass. Amphiumas have an array of predators. Just about anything that eats meat eats them (there are even a few recipes for amphiumas in Dr. Ernie Liner's The Culinary Herpetologist). 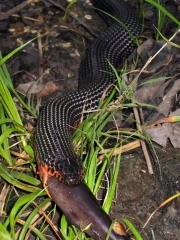 Their archenemy may well be the mud snake (Farancia abacura) which is believed to exclusively feed on them. Chief of Planning and Resource Stewardship David Muth, at Jean Lafitte National Historical Park and Preserve, tells of talking to a visitor on the ring-levee trail at the park's Barataria Unit. 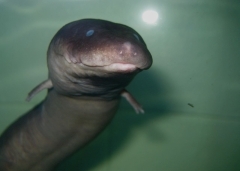 There was a sound nearby and they saw a foot-long three-toed amphiuma about as thick as a human thumb shooting into the air out of a crawfish chimney, pushing a little fountain of water ahead of itself. It was immediately followed by a two-foot-long mud snake. The amphiuma slithered through the shallow swamp water, and then disappeared down another hole with the snake in hot pursuit. This game of "nature tag" is constantly in play throughout these species' range. 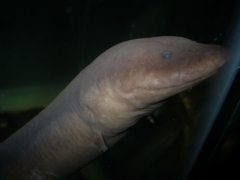 An interesting aspect of amphiuma's biology is the size of their cells and amount of DNA. Dr. Clifford Fontenot, Southeastern Louisiana University, says they have the largest cells of any vertebrate. Their erythrocytes are especially large. Dr. Pojman reports they have 28 times the amount of DNA as humans. Like many aquatic animals, they have a well-developed lateral line system (note the pores in the photos). Juvenile amphiumas have external gills which are lost as they metamorphose. Adults can respire via their lungs, bucco-pharyngeally (moving oxygenated water into and out of the mouth and throat), or across their skin surface (as do most amphibians). Courtship takes place in the water apparently in the winter months with an interesting twist, the females court the males. As many as five females nudge the male with their noses until a pair forms. They entwine, place their cloacas together, and exchange a spermatophore (a tightly formed ball of sperm). This form of internal fertilization, without the use of an intromittant organ, is called cloacal apposition (a technique also used by most birds). 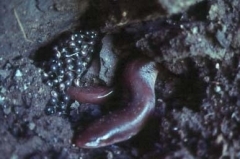 Females later find a secure, moist place possibly under a log or in a widened chamber of a crawfish burrow and lay about 200 fertilized eggs. Some have suggested that they do lay eggs in the water, but as far as I know, this has not been substantiated. The eggs exit in a pair of strings that are reminiscent of Mardi Gras beads due to the round eggs being connected to one another by a compressed segment of egg case. The female remains with her eggs until they hatch, guarding them and keeping them moist. Dr. Fontenot says the most frequent question about these animals is, "Are they poisonous?" Assuming this means are they venomous, they are not. Dr. Liner's recipes suggest they are not poisonous, at least to those brave enough to try them. Photo by Brad Moon. head portion of the lateral line system. Photo by John Pojman, Sr.
Another view of the head and upper body. Bite by another amphiuma--upper jaw. and the inner bite by the palatines. Photo by Bob Thomas. Photo by Brad Moon.